By adding electric stair lifts to your home you can ensure that your entire home is accessible for yourself as well as family members and friends who may be unable to scale stairs. Electric stair lifts are not a brand new technology but they are being refined regularly and the most modern stair lifts that we provide are sure to meet your needs and be aesthetically pleasing in your home without being bulky or in the way. Electric stair lifts are made for a variety of people, from those who are beginning to have a hard time scaling stairs to those who are unable to walk at all but still wish to explore the other levels of a home. The addition of a stair lift to your home can ensure that you and your friends and family will be able to explore parts of your home that you were not able to before. Multiple story homes offer the greatest amount of square footage and often possess beauty and charm – don’t let the stairs hold you back if you are unable to climb them; instead add an electric stair lift. You may fear that the addition of an electric stair lift could be costly and take you a great deal of time but with our installation experts you can have a stair lift installed in your home in no time at all. It is important to allow someone who is trained in stair lift installation install your lift because you want to guarantee that it is properly installed for the sake of safety. Keep in mind that it is also required by law in most states for lifts to be installed by a professional; so even if you think you can do the job on your own you may want to think again. 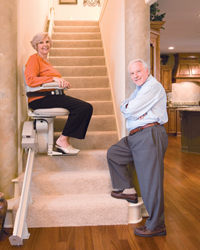 An electric stair lift could be the thing that changes the lives of you, friends, or family members. It may be a small addition to your home but it will allow those who were previously unable to explore your home to do so freely. An electric chair lift can grant a new sense of independence to those who must use it.